Are you ready to create virtual assistant service packages that sell? It's all in the packaging. Perceived value. 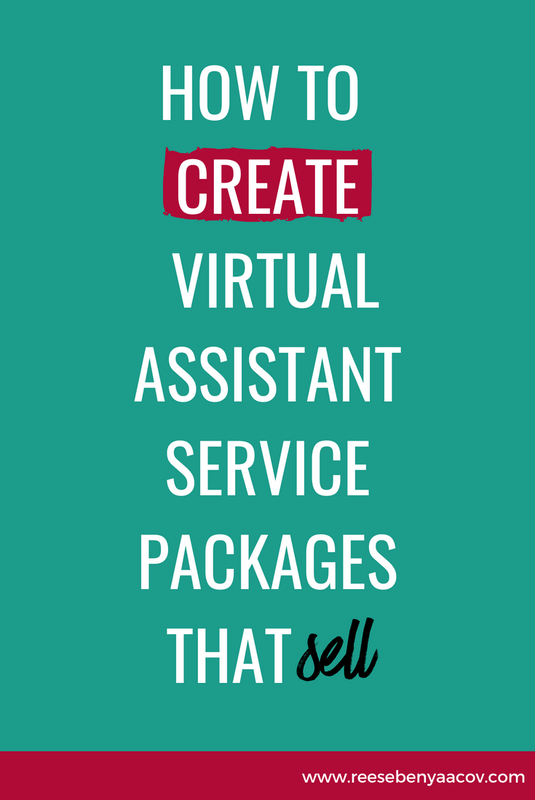 Let's talk about how to create your very own virtual assistant services package(s). First it's important that I mention that most virtual assistants trade their time for $$$. This isn't a bad business model but it does make it hard to scale your business. Your earning potential will be directly related to how much time you can work during the day. Imagine this. You hire a graphic designer to create a website. Would you expect your graphic designer to say "I will work on your site for 30 hours and I will charge you $3,000 for your site."? This scenario would never happen. Graphic designers quote you a price for a product, your website. Whether it takes them 3 hours or 30 hours, that's their business, not yours. You are paying for a finished product....results. It's up the graphic designer to know how to price his websites so that he can run a successful business that won't end up owning him. We don't go into business for ourselves to become a slave to our desk. We don't go into business for ourselves to stress out over our work on the weekends when we should be relaxing. We go into business so we can create the kind of lifestyle that we want. That's why it's important to recognize as early on as possible that trading hours for cash isn't going to be a scaleable business. The sooner you try to figure out how to package up your offerings, the better. Because once you start selling a package for your virtual assistant services, you can actually start scaling your business. But creating packages isn't always so easy. You need to know how much time it will take you to complete the services within in package. This way you can say, "if someone purchase package x, it will take me roughly 10 hours to complete, no more, no less". Some VAs do this very well while others struggle to understand how to create packages to market to their prospects. That's why I firmly believe that you shouldn't create service packages until you've got a lot of experience as a virtual assistant. It's important to remember that people don't buy virtual assistance, they buy solutions. I'm going to show you some great examples of how virtual assistants are packaging their services by highlighting the solutions they offer. But how do you sell solutions? Ask yourself these questions. What problem does my ideal client have? What does my ideal client want? How am I going to help them solve their problem or get what they want? Don’t just think about the questions. Write out your answers. Brainstorm what your ideal clients really want and look at the world from their perspective. To help you out, take a look below at some rock stars who started out as VAs but now market themselves using a different title (because titles really don't matter). Jamie DuBose of ZenplicityNow has it all figured out. She started out as a VA that exchanged hours for dollars and now Jamie works on a flat rate only and has plenty of package options to offer her clients. Well done. Next up is Amy Hall who is a WordPress and MailChimp specialist. Amy has some amazing packages focusing on MailChimp from creating a newsletter template to weekly or month newsletter management. This is a great way to package up a service. Last but certainly not least is Tonya Darlington, a virtual assistant business that supports business leaders. Check out how Tonya has put together some awesome packages. I couldn't add all of them in this screen shot, so make sure to click over to her site to see all the packages she offers. Now that you have a little bit more knowledge about how others are packaging up their services I'd love to see what you come up with. What services would you like to create a package for? Leave me a comment below. Should You Call Yourself A Virtual Assistant?